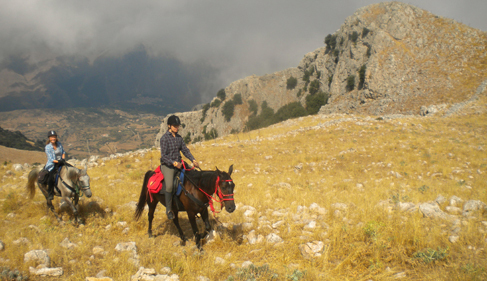 Sicily on Horseback offers horseback riding vacations in Sicily, an island off the coast of Italy in the central Mediterranean Sea. 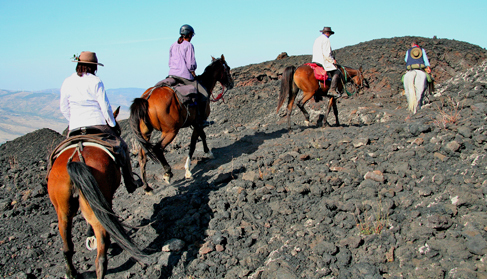 On these Equitrekking Travel riding holidays, you trek without danger through the unique environments of Mount Etna, the tallest active volcano in Europe and one of the most active in the world, the stunning Madonie Mountains and Nebrodi Mountains. 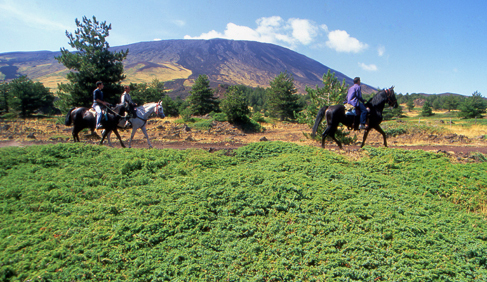 In June 2013, Mount Etna was added to the list of UNESCO World Heritage Sites. 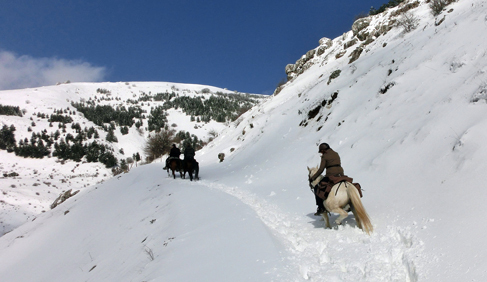 Horseback tours are available year-round. 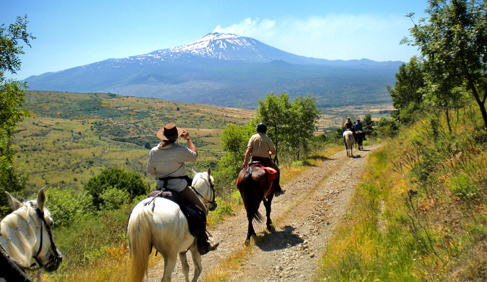 From February to November, ride well trained Sicilian horses to discover the amazing Madonie, Nebrodi and Etna Volcano National Parks with the history, traditions, people, ancient horse culture and incredible food of Sicily. Come in July and August to discover the Madonie Park, staying in two different country houses with swimming pools. 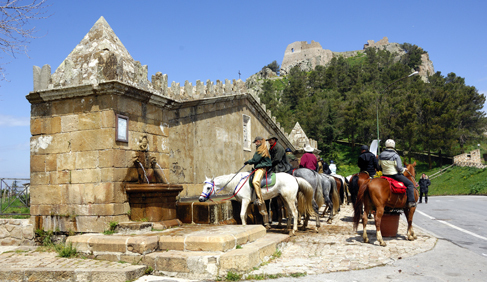 In September, participate in one of the oldest and widest Pilgrimages on horseback in the world, which attracts riders from all over Europe. 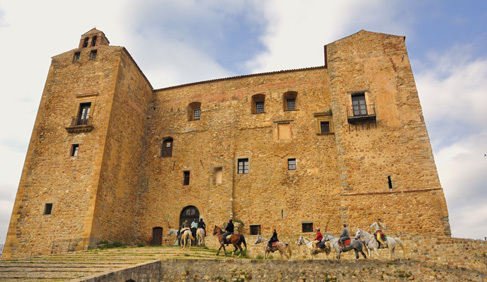 On these Italy riding tours, visit ancient villages in the mountains, many of which were founded by the Greeks, Arabs, Normans and Romans. 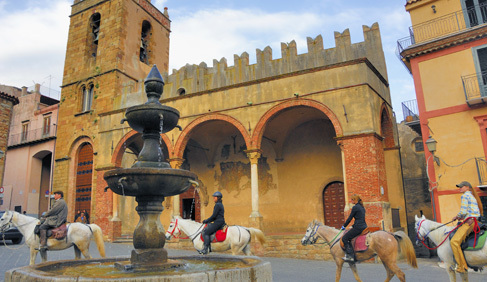 There are castles, cobblestone roads and ancient historical centers that can be visited on horseback. You'll experience authentic Sicily, where farmers still herd cows, sheep and goats on the hills and make delicious homemade cheese and olives are cultivated for oil and fruit, and grapes for wine. 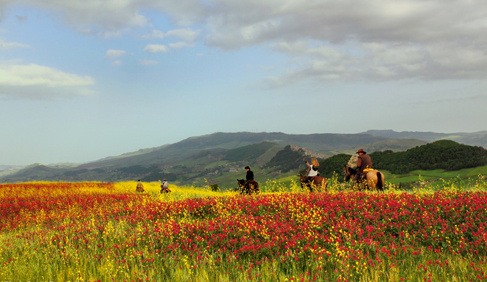 Sicily has the most historic and rich European horse culture, which you’ll experience on these travels. Stay in 3 and 4 star Country Houses (agriturismo). 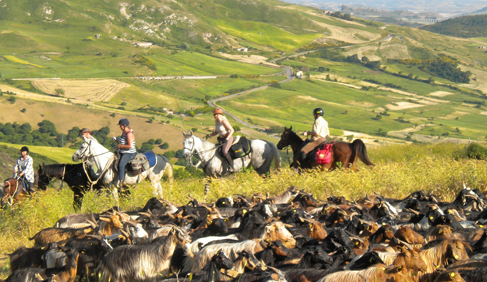 Sicily on Horseback's base is located in the Madonie Park not far from the historic town of Cefalù. The Country Houses have been hand selected by Franco and Paolo for the quality of their services, location and the overall quality of their food. Some of them have a swimming pool and one has a very good Spa. While some have cozy rooms, others are more simple, but all are clean and comfortable. All rooms have their own private bathroom with hot showers. Sicily on Horseback’s horses are all trained with the Gentle Horsemanship method of the “Six Keys of Harmony” from well-known U.S. trainer Ed Dabney. 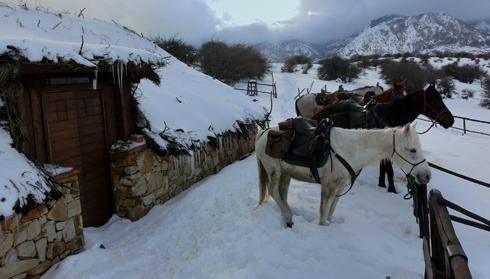 Franco and Paolo, the owners of Sicily on Horseback, studied at Dabney’s US Ranch. The horses are all Sicilian Indigenous breeds, including the Sanfratellano Horse, which is runs wild in the Nebrodi mountains, and the Sicilian Pure Oriental Horse, of which there are only 191 left. Their stud book dates from 1876. These are the some of the best endurance horses in the world! Biking, Bird Watching, Cooking Lessons (including pasty making), Photography Lessons, Six Keys of the Harmony of Horses, Sea Fishing, Golf (nearby), High Speed Internet, Spa, Wine Tastings, Hiking, Horseback Riding, Sight-seeing Tours. 7 day Madonie Park Tour–– a perfect mix of high mountains and nature. 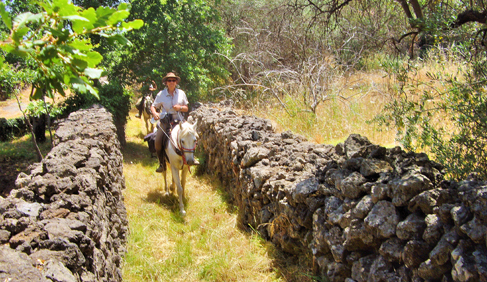 This riding vacation challenges with technical riding with some difficult passages (not difficult for our horses). 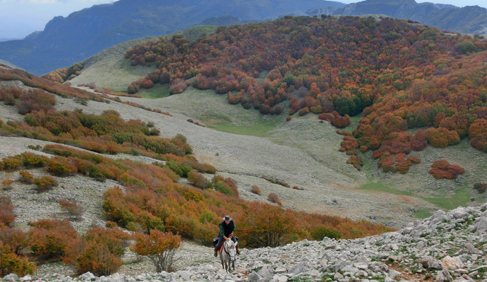 Horseback ride to medieval villages, meet with shepherds, enjoy cheese tastings and explore this astonishing mountain range. 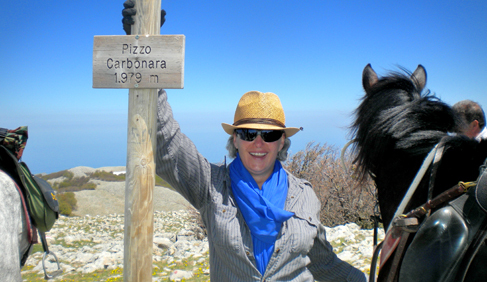 7 day Madonie, Nebrodi and Etna Park Tour–– Cross the mountains of Sicily from West to East. Everyday you ride through a different natural environment, discovering an unexpected European wilderness with much diversity of landscapes, natural wonders, wildlife and scattered medieval and Roman villages in the background. 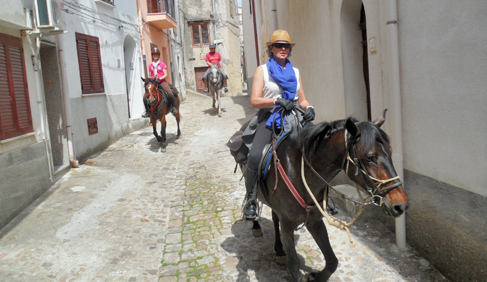 The riding is less challenging and there are no difficult trails, but there are some longer trots and canters, so you’ll need to be more fit for longer rides then for the Madonie Park Tour. July & August Stay & Ride Weeks–– During the hottest days of the year there is good riding up in the mountains, where there are cool winds and the temperatures are not too hot. Plus, there’s a swimming pool always handy. 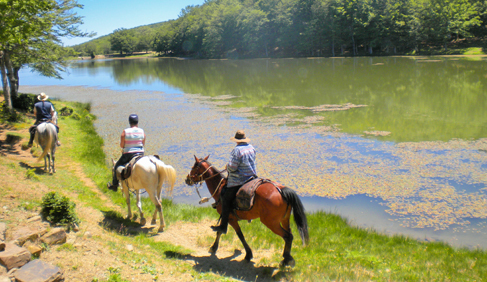 Enjoy three-hour trail rides daily and guided cultural visits or choose to just to relax in the swimming pool or Spa. These weeks are good for intermediate and advanced riders and also for beginners that “want to grow” as trail riders with our mountain trail rides and may wish to add in some lessons and Gentle Horsemanship clinics. 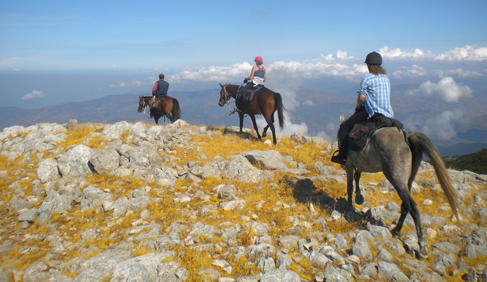 September Pilgrimage on Horseback Tour–– Venture to Capizzi village in the Nebrodi Mountains and participate in one of the oldest and widest pilgrimages on horseback in the world. Last year there were 740 riders from all over Sicily. 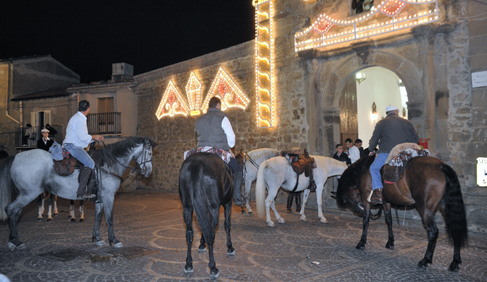 This riding vacation allows you to discover genuine Sicilian people and learn about their devotion to Saint Antony from Padova, who is remembered during this pilgrimage. 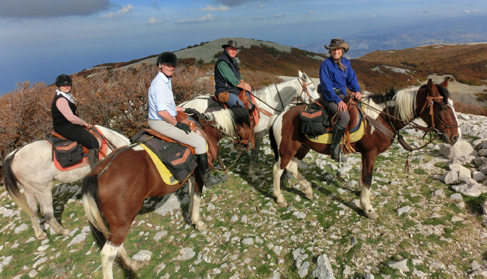 Custom Riding Tours–– Great for couples, families or groups, enjoy a holiday on horses designed for your specific needs and privacy. Available for all riding levels. Enjoy riding from 2 hours to as long as you desire on a custom tour. Several different riding itineraries are available. Contact Franco for more information. All inclusive from Airport to Airport.